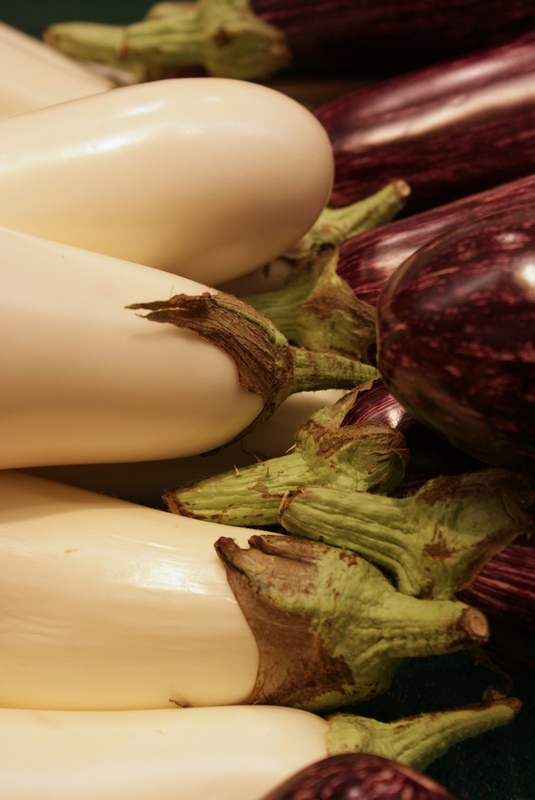 Eggplants belong to the nightshade family of vegetables, which also includes tomatoes, sweet peppers and potatoes. 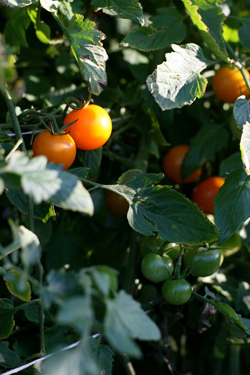 They grow in a manner much like tomatoes, hanging from the vines of a plant that grows several feet in height. GEOF grows several varieties of eggplant, including long Asian, Rosa Bianca, and the traditional black/purple. Eggplant is a very good source of dietary fiber, potassium, manganese, copper and thiamin (vitamin B1). 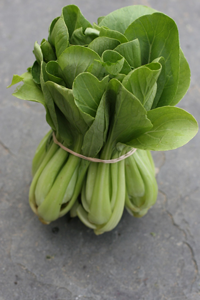 It is also a good source of vitamin B6, folate, magnesium and niacin. Eggplant also contains phytonutrients such as nasunin and chlorogenic acid. Eggplant also contains important phytonutrients, many which have antioxidant activity. Eggplant does not like severe cold, so store in the front part of the refrigerator where the temperature is around 46°F to 54°F. Eggplant is ethylene sensitive, so store it away from ethylene-producing produce such as apples. If kept in a plastic bag (to retain moisture,) eggplants will last up to five days. Eggplant can be eaten with or without the skin. 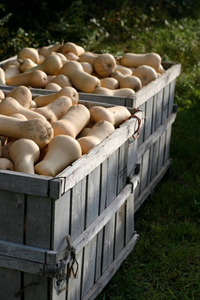 However, the larger ones and those that are white in color generally have tough skins that may not be palatable. To tenderize the flesh’s texture and reduce some of its naturally occurring bitter taste, you can sweat the eggplant by salting it. After cutting the eggplant into the desired size and shape, sprinkle it with salt and allow it to rest for about 30 minutes. This process will also pull out some of its water content and make it less permeable to absorbing any oil used in cooking. Simply rinse the eggplant after “sweating” to remove most of the salt. Eggplant can be baked, roasted in the oven, steamed, grilled, fried, stewed or pureed into dips. If baking it whole, pierce the eggplant several times with a fork to make small holes for the steam to escape. Bake at 350 degrees for 15 to 25 minutes, depending upon size. You can test for its readiness by gently inserting a knife or fork to see if it passes through easily. Eggplant also make a very good meat substitute for vegetarian or vegan cooking.